1. Bastrop 1832 Farmers Market - July 29th, 10am-2pm at 1302 Chestnut Street in Bastrop. Enjoy this covered indoor market with a wide variety of Central Texas products including fresh, locally grown fruits, vegetables, grass fed beef, naturally raised pork, farm eggs, local honey, artisan breads, savory prepared foods, baked goods, plants, herbs, soaps, candles, metal arts, handcrafted items, and more. Plus, they are currently accepting donation for the Bastrop Animal Shelter and/or the Bastrop County Emergency Food Pantry. Admission is FREE! 2. TNM Mud Bogg - July 29th, 11am-7pm at 1515 Upper Elgin River Road in Elgin. Fun in the mud and live music with Pete Benz and Kenny Orts & No Chance Band! Gates open at 10:30am, and there's a mandatory driver's meeting at 12pm. Tickets sold at the gate (cash only) - $10.00 General Admission, $30.00 each Truck (includes General Admission), $15.00 each ATV, UTV & Side-by-Side, age 10 & under free. 3. Edwin Neal & R.A. Mihailoff Autograph Signing - July 29th & 30th, 12-7pm at The Gas Station, located at 1073 Hwy 304 in Bastrop. Join horror icons Edwin Neal and R.A. Mihailoff for some BBQ at The Gas Station, which was featured in "Texas Chainsaw Massacre." BBQ and autographs will be for sale, and admission is FREE! 4. 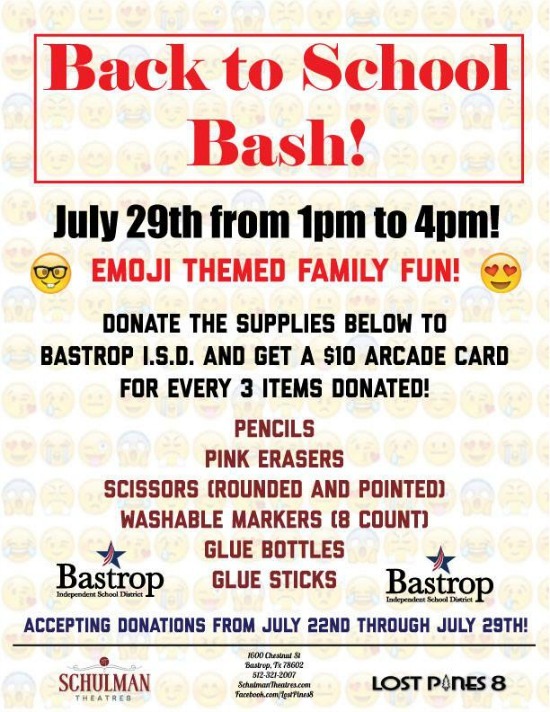 Emoji Back to School Bash **FEATURED EVENT** - July 29th, 1-4pm at Schulman Theatres Lost Pines 8, located at 1600 Chestnut Street in Bastrop. Enjoy fun games and prizes, and get a $10 arcade card when you donate select school supplies. Admission is FREE! 5. Kid's Decorating Class - July 29th, 3-4pm at Johnson's Bakery, located at 715 Old Austin Hwy, Ste. 300 in Bastrop. Everyone takes home their own decorated goodies! $15/person. Reserve your seat by calling (512) 412-6221. 6. 21st Annual Casino Night - July 29th, 6-10pm at the Smithville Rec Center, located at 106 Gazley Street in Smithville. Dinner buffet, gaming, raffles, and more! $40/person in advance or $45/person at the door. Ages 21 and over only. 7. Cotton Bowl Speedway Racing - July 29th, 6:30-11:30pm at Cotton Bowl Speedway, located at 1175 CR 202 in Paige. Gates open at 5pm, races begin at 7pm. Live music with Huser Brother Band after the races. General Admission: $15/Adult, $12/Military, Seniors, & Students, $5/Child ages 6-12, Children 5 & under FREE; Pit Pass Admission: $30/person. 8. Family Movie Night on the Field - July 29th, 8:30-10:00pm at RCRC Baseball/Softball Fields, located on Humble Lane in Rockne. Bring a blanket or chair and watch "Moana" under the stars! Concessions will be available; cash only. Admission is FREE! 9. Yoga! in the Park! - July 30th, 8:30-9:30am at Neighbor's Kitchen and Yard, located in the Crossing at 601 Chestnut Street in Bastrop. Suggested donation $10-$20/person. A portion of the proceeds are donated to Keep Bastrop County Beautiful. 10. Getting Upside Down Workshop - July 30th, 4:00-5:30pm at Body and Shine Wellness with Katy, located at 28 N. Main Street in Elgin. This workshop will help you build confidence in inversions, no matter what your experience level. Free for unlimited members, $20/non-member. 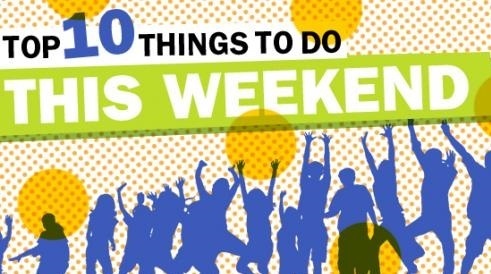 If you would like to be a featured event in the Top 10 Things to Do This Weekend, a featured special, or the Top 10 Things to Do This Weekend sponsor, please email info@365bastrop.com for more information. Or click here for more details about advertising with 365 Bastrop. We offer banner ads, newsletter ads, sponsored blog posts, and more!